My husband calls this chicken ‘panna cotta’ by the way. 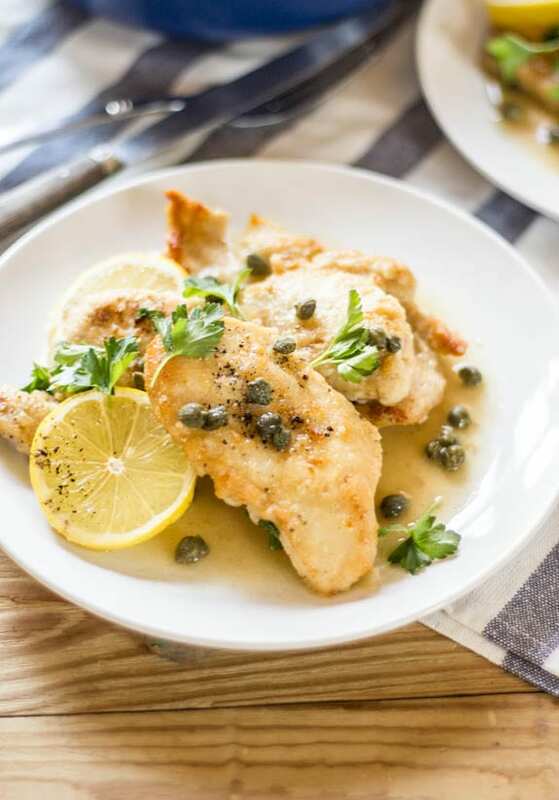 Chicken piccata happens to be a childhood favorite of mine; tender chicken simmered in white wine, lemons and capers. It requires little effort, and I usually have most of the ingredients on hand (i.e. the wine). This dish is very adaptable too. I’ve made it several different ways, including a version with mushrooms and beef stock. I also use half the amount of butter found in traditional recipes giving it a light and fresh update. 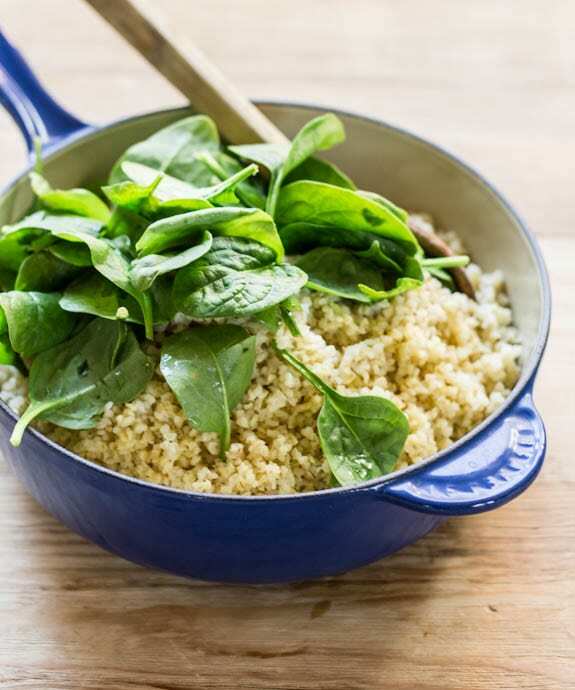 Couscous was my original go-to, but the combination of cracked wheat or bulgur and baby spinach is my new standby. To make it extra flavorful, I cook the grains in chicken stock. The residual heat wilts the greens making it the perfect bed for this juicy dish. FYI- I’ve pretty much replaced couscous exclusively with this alternative grain. 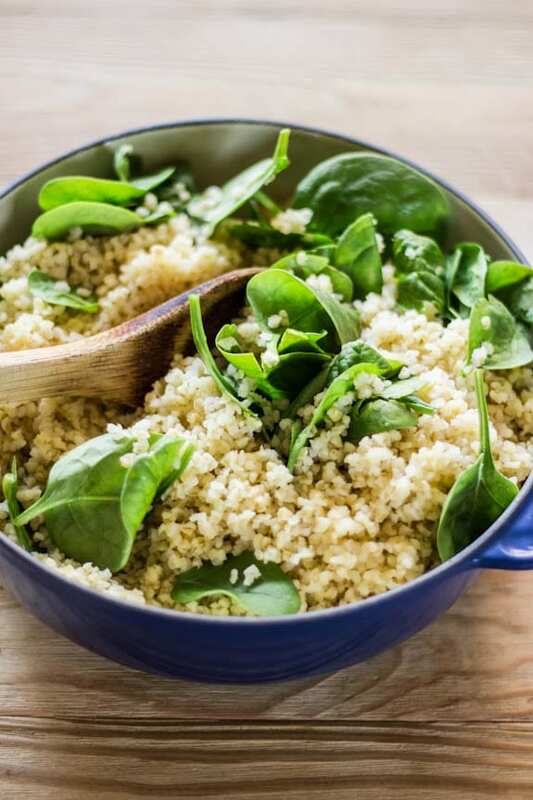 Although the texture is very similar, cracked wheat is packed with protein and fiber making it a healthier option. I use an instant kind which is conveniently ready 10 minutes. If your ingredients are well organized, this meal will only take about 30 minutes to get on the table. I somehow manage to destroy my kitchen whenever flour and chicken is involved, but the mess is well worth it. It has become an easy, weeknight staple in our house. To save on time, you can purchase thinly sliced chicken cutlets instead of regular sized chicken breasts. Or to save a couple bucks, simply slice them yourself. If you cannot find cracked wheat, try using couscous, rice or another grain of your choice. To make this gluten free, substitute with gluten free flour where applicable. I grew up eating chicken piccata. It's a meal time tradition I'm happy to continue. Watching my mom make this over the years, I've learned that it's all about organization. Here's my tip: while the chicken browns, use that time to prep the rest of your ingredients. Dice the shallots, open the wine (have a glass!) and make the garnish- this way, you're one step ahead. You will need a large, 12- inch skillet. Alternatively, brown the chicken in batches or use two pans if you're comfortable multitasking. Couscous and Jasmine rice make excellent quick-cooking side dish options. Bring a large pot of chicken stock to a boil. Add the bulgur wheat. Remove from the heat, and keep covered for about 20-25 minutes or until tender (drain any extra liquid if necessary). Add the olive oil and 2 handfuls of spinach. As you begin to stir, the residual heat will wilt the greens. Add the rest of the spinach and keep warm until ready to serve. Add ½ c. flour to a shallow bowl; add the remaining 1 teaspoon to a separate bowl for the sauce. Dredge the cutlets in flour shaking off any excess as you go. Transfer to a plate. In a large 12-inch skillet, warm 1 tablespoon of olive oil and 1 tablespoon of butter over medium-low heat. Add the chicken and brown on both sides, about 3 minutes per side. Work in batches or use two separate pans. Transfer the chicken to a plate and cover with foil to keep warm. Note: it is important to monitor the heat so that the flour does't burn. This will impart a bitter flavor to the sauce. While the chicken is cooking, prep the rest of your ingredients. Dice the shallots, mince or crush the garlic, open the white wine, rinse your capers, chop your parsley, and slice the lemons for garnish. If you use this time wisely, the dish will come together quickly in the end. To make the pan sauce, reduce the heat to low. Add 1 teaspoon of oil to the pan. Saute the shallots until soft, but not colored, about 1 minute. Add the wine and bring to a boil, scraping up any brown bits stuck to the bottom of the pan. Reduce the liquid by half. Add the chicken stock and bring to a boil. To thicken the sauce, add a splash of stock to the reserved teaspoon of flour and whisk well to dissolve any lumps. Add the flour mixture to the pan, whisking constantly, until the sauce is slightly thickened. Reduce the heat to a simmer. Stir in the remaining 1 tablespoon of butter. Add the juice of half a lemon and sprinkle with capers. Return the chicken and any accumulated juices to the pan. Taste the dish; season with extra lemon juice, salt and pepper if desired. To serve, transfer the chicken to a serving platter and spoon the sauce over the top. Garnish with lemon slices and fresh parsley. Serve with bulgur wheat and spinach on the side. 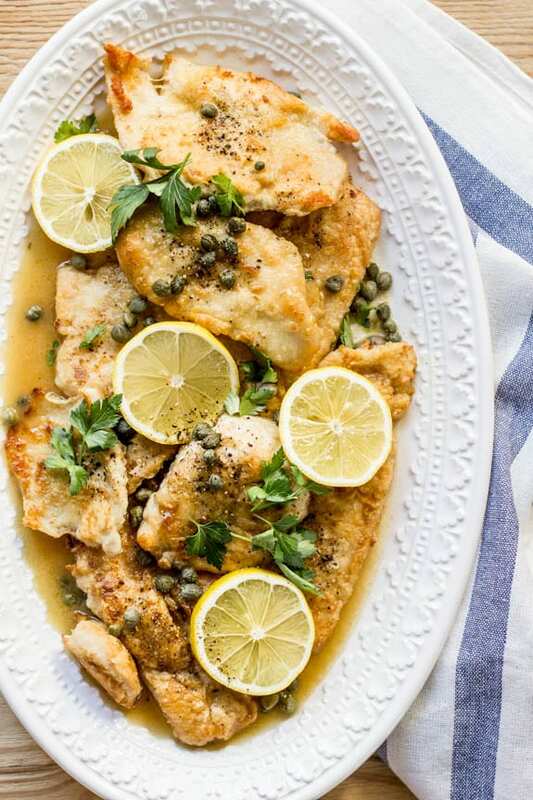 Chicken Piccata is one of my favorite dishes..there’s something about the lemon and capers that I just can’t get enough of! I’ll have to try the cracked wheat. We found a harvest grain blend at Trader Joe’s that has couscous, orzo, lentils, and garbanzo beans and we’ve been eating it with just about everything! This dish looks fantastic. I am such a big fan of chicken piccata and I make it on a regular basis. I must try yours! And that serving dish is to die for! Mercy be. Yummmy! This is going on next week’s dinner menu, for sure. And I already have all the ingredients. Yay! What a wonderful meal! Some classics have just been done to the proverbial nth degree, and I often think, “Oh no, I am just not going to do that recipe.” But your version of this is a stunner, and so beautifully presented. Your style is light and engaging, yet so tempting. You made me laugh with the mention of your husband. Bart always comes sup with the goofiest names for things. Husbands – gotta love them… Happy New Year to you! This is so so pretty. I love bulgur wheat and appreciate what you’re saying. I love that you offer tiny alternatives. Not only do I give anything to cook like you do, but also to take photographs this brilliantly !! Beautiful food as usual. This looks simple and homey and delicious all at the same time! Gorgeous, I love these light and vibrant flavors! We had this for dinner this weekend and it is a new favorite! Thank you! Love it. I make the same thing with pork as I am not a huge fan of chicken. I love the side dish too. Making something similar tonight! Beautiful photo’s ! Wow! 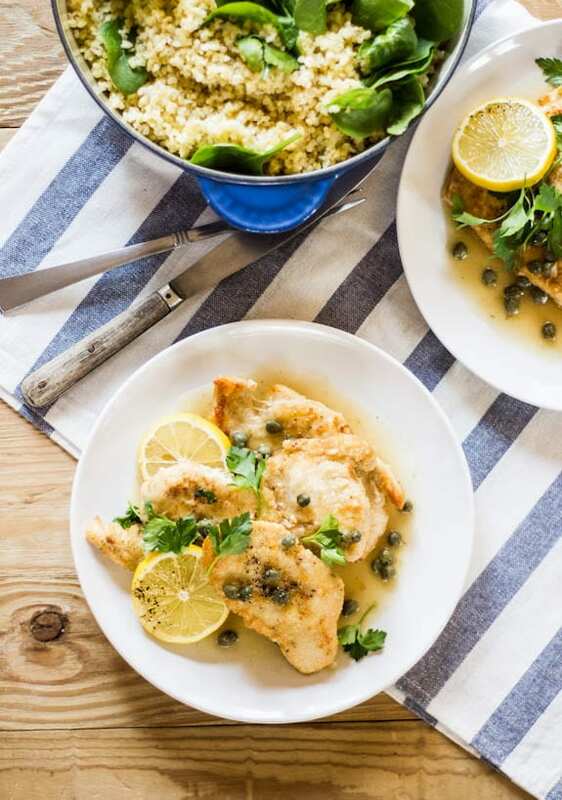 I love Chicken Piccata and this version served with spinach and bulgar wheat on the side seems so satisfying! Can’t wait to try it out! I will be picking up the ingredients for this delightful recipe later this week – cannot wait!! (my boys have never been caper fans but I’m hoping the lemon flavor will overtake them ;-) and they will discover a new love. Try and try again, right?). Such a beautiful recipe. Thanks for sharing this one – x. Thank you for the delicious recipe. Can’t wait to try more! I totally know what you mean by not wanting to go out to the ‘hurried’ dinner with kids. I have a 2 & 4 year old and it’s always crazy, not matter what. But that’s why we have wine, right? Wow that looks superb! Seriously perfect!!! Delicious! My kids loved it too. Thank you! Oh boy, was this good! I was a little apprehensive, since my husband isn’t a bit chicken piccata fan, but he went back for seconds on this and finished it off! Served mine tonight over forbidden (black) rice with a side of broccoli. The sauce on the leftover rice will be delicious for lunch tomorrow ;) Thank you, Emilie, for another new favorite. Can’t wait to make this for company! I love, love how you made this classic so fresh and vibrant! Sharing this for sure. Keep up the beautiful work Emilie. I grew with chicken piccata. Depending on who made it, the recipe wold vary slightly… sometimes mushrooms, sometimes capers, sometimes beef stock. And I always loved it. Still do. That’s why I was inspired to share my updated, lighter version we eat weekly. Honestly, I think the sauce is my favorite part. With bread of course! Thanks again for taking the time to stop by and comment, Karen. I really appreciate it! This recipe looked so good I had to try it. It took about an hour to make and it ended up looking just like the pictures. That never happens! I couldn’t believe how good it tasted and that I actually could make something that good. Thanks for the great recipes and website! This will be on the menu for tonight! Healthy comfort food is exactly what I’m always on the lookout for since my husbands tends to lean to the comfort side and myself to the healthy side. This looks like a great combo of both! I just made this again last night for dinner ;) We have the same situation in our house; my husband likes comfort food and I like healthy. Hence the reason for this blog! If you’ve never made this before, here’s a great tip: while the chicken is browning, use that time to prep the rest of the dish (shallots, wine, garnish etc). It comes together quickly in the end and this way you’ll be prepared. I mention this in the actual recipe itself but it never hurts to say it again. Thank you for such a great recipe that’s easy to follow and turns out like the picture!! This looks so good! Thanks for the tips to make it Gluten free. I shared this on pinterest. Hi Anjelica! I love when that happens! Yay! So glad you liked it. I have to say, this is one of my most popular recipes so I put it in my book too! 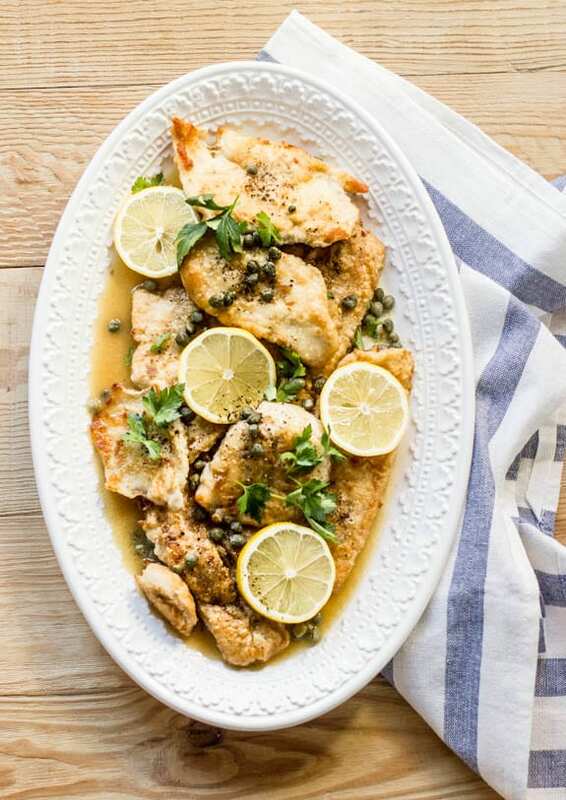 Chicken Piccata has always been a family favorite. I want to make it for a dinner party of 10. I have only 1 skillet with which to work for initial browning. Can I adapt the recipe to finish off in the oven, since I will be working with a lot of chicken? Thanks!